Here in the U.S., the Bureau of Labor Statistics (BLS) found that in 2015, there were more than 4,800 work-related deaths and 2.9 million injuries to private sector workers. That same year, government employees suffered another three-quarter of a million injuries or deaths. The key to improved workplace safety is engaging employees. Engaged workers are committed to both doing their jobs well and to the success of their company. They’ll go to great lengths to do a good job, as well as freely offer their honest opinions and suggestions. Lack of acknowledgment or thanks, however, can cause them to become disengaged. This is especially true when it comes to safety issues. Although they’re required to do so, these workers often fail to report minor injuries or workplace hazards. Disengaged workers might ignore safety rules, and could also take unsafe shortcuts to save time or effort. Getting employees engaged in safety issues starts by management actively promoting workplace safety. This will both help promote safe work practices and boost morale among workers. A 2016 meta-analysis by Gallup, the company best known for its public opinion polls, looked at more than 230 businesses to measure their levels of employee engagement. The study found that the top 25% of firms with engaged employees had 70% fewer safety incidents than those companies in the bottom fourth. The link between workplace safety and employee engagement isn’t a new concept. A 2002 study by the Society for Human Resource Management (SHRM) into Molson Coors Brewing’s operations showed that disengaged workers were five times more likely to be involved with a workplace safety event than their engaged colleagues. This same group was also seven times more likely to be involved with a safety incident that caused downtime. After seeing the results, Molson Coors doubled down on their commitment to engage their workers. The company managed to save more than $1.7 million through fewer worker injuries and less downtime. Building and keeping a safe work environment can be a real challenge. A good way to start is by giving employees a say in workplace safety matters. After all, they’re the ones closest to the problem on an everyday basis, and their insight can help hold down the number of accidents and injuries. Businesses will see an increase in production due to less downtime and worker morale will be higher. -Hold Safety Meetings. Bring workers from different departments together to discuss safety issues. This will instill a sense of company unity. -Use Surveys. Brief surveys let workers know that their opinions are both wanted and valued. -Stand Down. Suspend work for a few minutes now and then to show employees the right way to respond to hazards and accidents. Talking with workers about safety helps get and keep them engaged. Talking will also let them know that you’re concerned about their safety. -Hold Safety Drills. Practicing how to react to different types of workplace accidents will promote teamwork. It will also ensure all parties know exactly what to do in the event of an injury or accident. -Encourage Ideas. 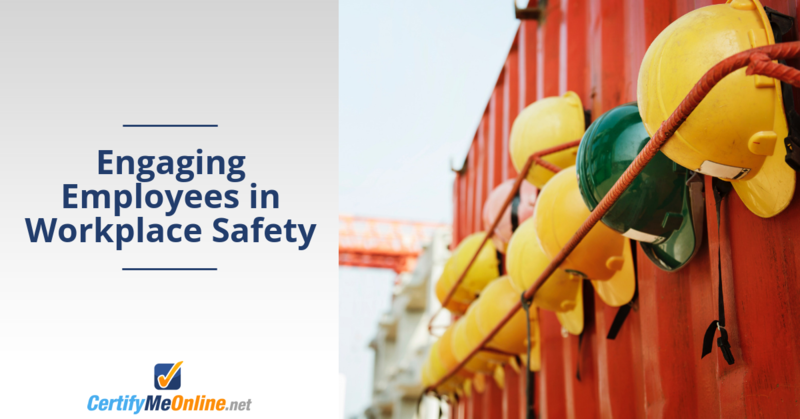 Urge employees to come up with safety ideas based on the matters that are most important to them personally. An example would be an aerial lift operator calling for a policy that requires all lifts to be checked before each use. This direct engagement will let workers know that management cares about their well-being. To keep them engaged, it’s important that they’re recognized for their efforts. -Keep Communications Open. Managers and supervisors should be approachable, encourage employee feedback and have open door policies. Once they’re put to use, these tips can help you build and keep a safer workplace. The more engaged your workers become, the more positive results you’ll see in terms of safety, productivity and employee morale.